How and when did you first start running? I started running in 2014 after deciding I needed to change my lifestyle (think couch potato) and set myself a goal of running the Great North Run before I turned 40.. 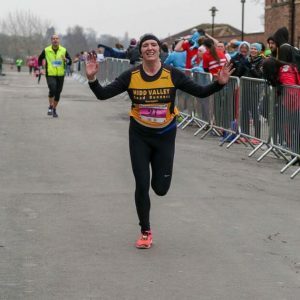 I did the Couch to 5 K course on a treadmill someone gifted me, then booked myself onto the Harewood Half in 2015 – my first ever race – the running bug well and truly got me! What brought you to Nidd Valley? A school mum (Nadene Wilkinson) had joined and said how it had improved her running, as well as how friendly everyone was, so came and gave it a go.. I had plateaued running on my own, and needed something to mix it up. What is your favourite running music? Genre or specific tracks? I’m more of a podcast girl as the chat helps me take my mind off the pain. Current favourites are Simon Mayo’s confessions, Marathon Talk and Standard Issue. Always feel I have learnt something after a run! What is your best running tip that you would like to share with us? Never lose the enjoyment of running or lose sight of why you run. Its not always about times but about doing it for you. What is your proudest moment in your running career? Harewood Half has a special place as it was my first ever race but doing the Great North Run twice before I turned 40 has to be the most proudest moment. Also inspiring friends and family to take up running!